A fabulous evening opening up our voices and experiencing the medicine and magic found within these Sacred and Shamanic Chants. 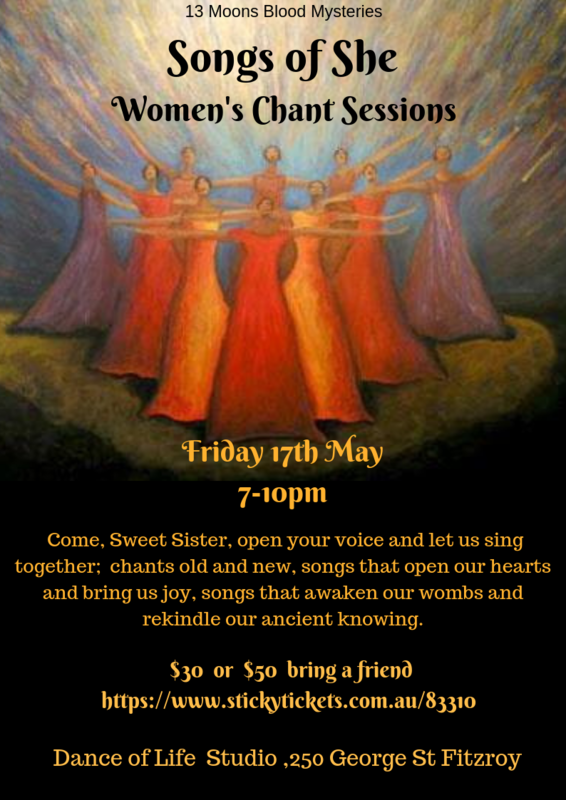 Not only is there bliss found in singing these beautiful and potent chants, but we also experience the sound of all our sisters voices bathing us in an ancient resonance that enlivens and awaken's. We invite you to nourish your spirit and experience this deeply held , beauty filled evening. Love to see you and share the beauty and blessings these song bring. ​Sit in circle and open up your voice, hear the beauty from within and the beauty all around you. There are some chants that sing inside you and call you deep inside to the infiniteness within. There are chants that shift and move that part that is asking to be loved. There are moments of absolute bliss and love, there are others that may have you feel uncomforatble stirrings. Feel the medicine working, coursing through your being calling you awake, calling you home to the truth of who you are in all your magnificence. Come Sit, sweet sister and allow the vibration of these chants and the medicine they have to impart stir life alive within you.